At The Valley Nursery & Kids Club supporting you with your child's care and education is our privilege. 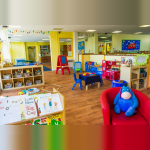 With 6 large, well resourced, airy children's rooms as well as 3 outdoor play areas and a sensory room we offer nurturing and knowledgeable care to children aged 2 months to 11 years through a team of highly qualified DBS checked child-carers and teachers. Sessions include full and part time day nursery care, term time and all year round pre-school sessions, wrap around care to and from school nursery, a breakfast club, after school club and holiday club. We hold excellent Ofsted reports as well as a 5 star environmental health award supported by a nutritional and varied menu tailored to different age groups. Our fees vary depending on your needs and include discounts such as sibling discounts, full-time discounts, other. So, please ring us to find out more.